We have no idea how this is possible, but we also don’t want to shoot a gift horse in the mouth. So let’s just go with it, people! Last week, a deal appeared on Amazon that blew us all away. 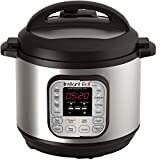 After the Instant Pot DUO80 8 Qt 7-in-1 Multi- Use Programmable Pressure Cooker went on sale at a very respectable $42 discount for Black Friday 2018, it some how went on sale at an even more impressive $61 discount for Cyber Week. We expected the deal to sell out quickly and thousands of our readers took advantage of the sale, which drops the largest version of Instant Pot’s most popular cooker to its lowest price ever. It didn’t sell out, though. In fact, it’s still available! You can still snag this 8-quart beauty for $79, which is actually $0.99 less than the price of the 3-quart model. We doubt this deal will be back anytime soon, so get in on the action while you still can. And if you’re looking for a fancier model that integrates with your smartphone, the $150 Instant Pot Smart WiFi 6 Quart Electric Pressure Cooker is on sale today for just $90! Amazon just announced the best-selling Prime products of 2018 – did you get them all?